Congratulations to Trev Tripcony for taking out the coveted Offshore Surfers Open Title for 2016 winning an awesome Sumatran surf charter trip. The title came down to the exciting final heat of the year with Trevor holding off the charge from the Wallace brothers. 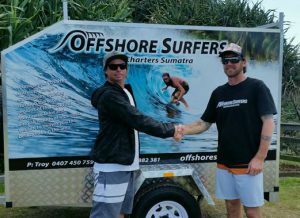 Massive thanks to Offshore Surfers for their support. Do yourself a favour and check out their website. We hear nothing but rave reviews from those that climb aboard.